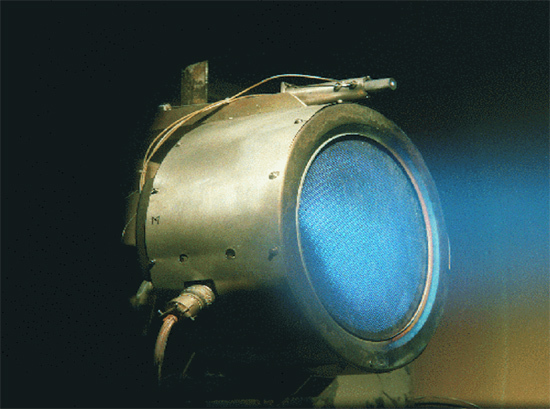 The Helicon Double Layer Thruster (HDLT). Credit: Australian National University Research School of Physical Sciences and Engineering. Electric double layers are like waterfalls that energize charged particles falling through them. A double layer forms in plasma when electric charge flows through it. Double layers are found in the plasma environment of Earth, as well as around the stars, creating phenomena like aurorae and electromagnetic radiation from pulsars. Thermal emissions from hot filaments in lightbulbs led plasma pioneer Irving Langmuir to contemplate the behavior of charged particles moving through various gases. He was the first to coin the term “plasma” when referring to such ionized gas. Since charged regions in gas tend to isolate themselves from the environment, as well as act in ways not governed by mechanical theories, he thought they appeared similar to the organic plasma component of cells, so he used biology-based terminology. Scientists from the National University Research School of Physical Sciences and Engineering in Canberra discovered double layers in their laboratory plasma systems, finding that they were accelerating ions to supersonic velocities. The double layers are self-generating, so the effect has been incorporated into an efficient spacecraft thrust mechanism. As mentioned, a double layer is an electric charge separation region that forms in a plasma. It consists of two oppositely charged parallel layers, resulting in a voltage drop and electric field across the layer, which accelerates the plasma’s electrons and positive ions in opposite directions. Since moving electric charges generate electricity, there is an electric current present. If there are sufficiently large potential drops and layer separation, electrons might accelerate to relativistic velocities, producing synchrotron radiation. Electric forces can accelerate charged particles with energies of 10^20 electron volts or more. Since electricity requires a circuit for charge to flow, and an electric current forms a magnetic field, that field tends to constrict the current. As pointed out in previous Picture of the Day articles, that constricted channel is known as a Bennett pinch, or z-pinch. The pinched filaments of electric current remain coherent over large distances. Laboratory experiments with particle accelerators confirm the observation. Plasma’s behavior is driven by conditions in those circuits. Fluctuations can form double layers with large potential voltages between them. The electric forces in double layers can be much stronger than those from gravitational and mechanical forces. Double layers separate plasma into cells and filaments that can have different temperatures or densities. At times, a double layer might interrupt charge flow in the circuit, causing a catastrophic rise in voltage across it. The powerful energy release of the exploding double layer is sometimes observed in power transmission switchyards when a circuit breaker is opened incorrectly. Hannes Alfvén identified just such an occurrence when he was contracted by the Swedish Power Company to investigate some serious accidents that had occurred. A few of the mercury arc rectifiers used in the power transmission circuits had exploded for no apparent reason. Alfvén identified the cause as unstable double layers within the plasma flow. There are also double layers in space that emit radio waves over a broad band of frequencies. They can sort galactic material into regions of like composition and condense it. They can accelerate charged particles to cosmic ray energies. Double layers in space can explode for the same reason as Alfvén’s rectifiers, releasing more energy than is locally present. This effect can be seen in stellar flares or so-called “nova” outbursts. Since plasma is composed of charged particles, their movement constitutes an electric current, which generates a magnetic field. Electrons spiral in the resulting magnetic field, creating synchrotron radiation that can shine in all high-energy frequencies, including extreme ultraviolet, X-rays, and gamma rays. According to Alfvén and others, electric power flows along the spiral arms of a galactic circuit where it is concentrated and stored in a central plasmoid within the galactic bulge. When the current density reaches a critical threshold, the plasmoid discharges along the galaxy’s spin axis as an energetic jet of plasma. That phenomenon has been replicated in the laboratory with a plasma focus device. Cosmic plasmas and their activity can be replicated in the laboratory, allowing insights into the large-scale structures that populate the Universe. Since gravitational forces cannot be examined in the laboratory, consensus opinions about the gravity-only model of celestial objects suffer from a moribund condition. Hopefully, a fresh perspective will outshine the dark conditions that dominate today’s approach.